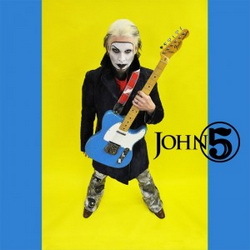 While ‘The Art of Malice’ is an instrumental album; you probably don’t need to be a guitarist to know who John 5 is. John 5 has played guitar for Marilyn Manson and is the current axeman in Rob Zombie’s band. Rubbing shoulders with two of the freakiest dudes in modern rock/metal surely goes some way to explaining John 5’s compulsion to shave his eyebrows and apply the face paint. The Art of Malice is John 5’s third solo effort and shows the country-infused chicken-pickin’ shredder continuing to expand his chops and grow as a songwriter. Where ‘Requiem’ and Songs for Sanity affirmed his place in the pantheon of interesting and intense guitar instrumentalists, ‘The Art…” will go a long way to securing his position as an equally interesting songwriter as well.